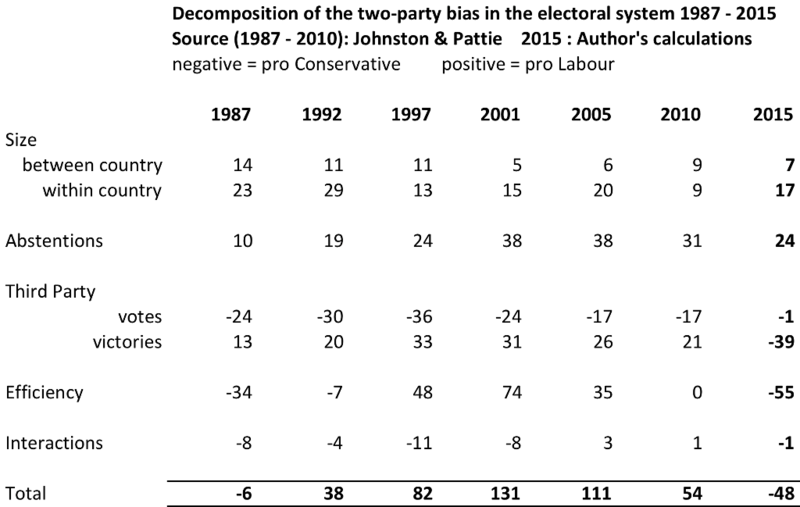 At this election the two-party bias (or skew) in the electoral system moved from a pro-Labour bias of 54 seats, to a pro-Conservative bias of 48 seats, meaning that if the two parties had won the same number of votes, the Conservatives would have won 48 more seats than Labour. The table below shows the decomposition of factors that result in this bias. These can be obtained algebraically using Brookes’ decomposition method, as adapted by Johnston, Rossiter and Pattie. For a full explanation of the factors please re-read this entry. Equalization of constituency electorates with a major boundary review is going to be a high priority for the new Government. Should the legislation end the over-representation of Wales and slight over-representation of Scotland relative to electorates in England, and succeed in equalizing electorates within nations, then the Conservatives could theoretically find themselves defending a majority of 36 seats instead of 12. 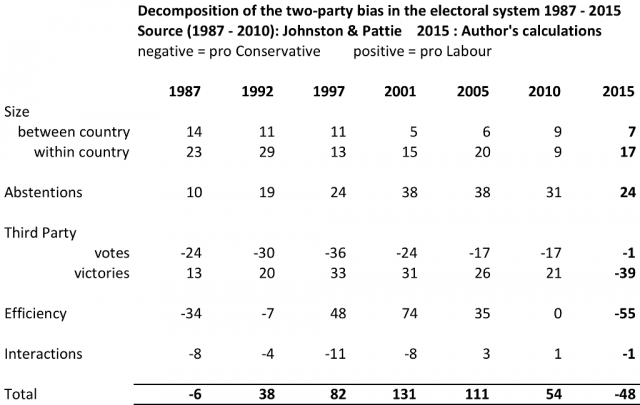 Some might argue that as the system is now favouring the Conservatives, the party should proceed more cautiously in order to avoid accusations that they are trying to load the system further to their advantage. Note: This post originally appeared on the Nottingham University politics blog and is reposted with permission. It represents the views of the author and not those of Democratic Audit UK or the LSE. Please read our comments policy before posting. And I thought it was they had £14 to 1 spending power.